A policy regarding public parking charges put into trial operation in December 2012 has been suspended because of incomplete regulations and related issues. The trial operation, which was set to finish in 3 months ended after only one month. People have increasingly been questioning what the parking fee schedule is, where the money is going, whether the contractor is qualified or not and what can they do if their cars get damaged while parked in the past month. According to Sanya officials, for middle-size cars the cost is 4 Yuan every half hour, with a max charge of 25 Yuan per day in the daytime and 10 Yuan at night. 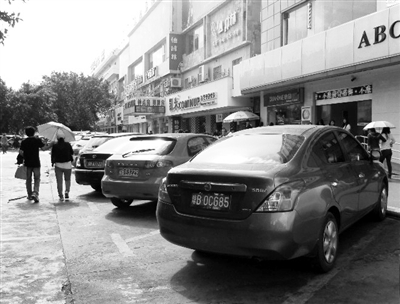 For a small-size car, it costs 3 Yuan every half hour, with a maximum charge of 25 Yuan in the daytime and 8 Yuan at night. However, the charges were a unilateral decision made by the Sanya local government, which made the public wonder whether they were fair and just. Besides, residents have started to lose faith in the scheme because of the poor management. The plan covered major road sections and streets including Shangping Street Avenue and Hedong Road, with a total of 3,288 new parking lots. It originally aimed to ensure the efficient use of public resources and ease the traffic jams in Sanya.